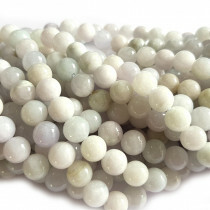 Jade refers to two distinct types of stone - Jadeite and Nephrite. 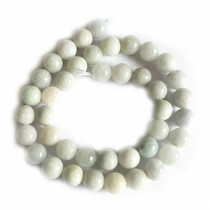 Burmese Jade is Jadeite which is the rarer and more valuable of the two. In 1863, French mineralogist Alexis Damour analyzed bright green jades from Burma. 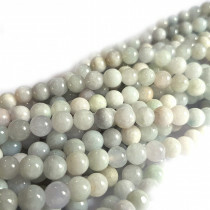 When he found these samples to be different from what was called Chinese jade (usually amphibole jade, or nephrite), he named the mineral jadeite. 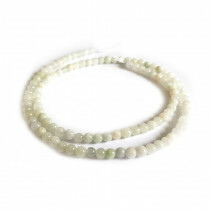 The most important source of gem quality jadeite is Upper Burma, near the small town of Hpakan. Today, virtually all top-quality jadeite is produced from these mines. Jade is considered a symbol of purity and serenity. A protective stone bringing harmony, good luck and friendship. 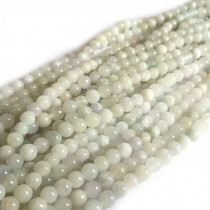 Natural Burmese Jade Gemstone Round Beads 8mm (~52pce Strand) - ~38cm Strand. 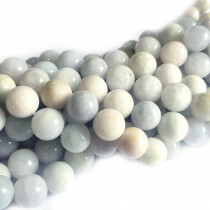 Natural Burmese Jade Gemstone Round Beads 10mm (~38pce Strand) - ~38cm Strand.